German brand Bosch is one of the biggest and most popular fridge freezers brand in the UK. With an extensive range of freestanding, integrated and American-style fridge freezers to choose from, there’s a stylish Bosch fridge freezer option to suit every home. Renowned for their German build quality and reliability, Bosch fridge freezers are available in a range of sizes and finishes – including sleek stainless steel, smart black, classic white, and the striking Bosch Cast Iron. Digital displays and temperature alarms make it easy to maintain the temperatures you want, and with energy ratings of a minimum of A+, our Bosch fridge freezer range helps you save on energy costs too. Frost-free and Auto Defrost options mean you can say goodbye to manually defrosting your fridge freezer, while ensuring your food is kept at the right temperature 24 hours a day. The Bosch Multi Air Flow system also gives better circulation of cool air around the fridge compartment, for better performance. And handy extras, like this Bosch’s LED lighting, provide bright lighting to let you see all you’ve got in the fridge, while consuming less energy. Whether you’re looking for a simple little fridge freezer to fit your compact kitchen, or a statement American-Style unit that’ll serve the whole family, Bosch fridge freezers provide stylish, energy-efficient solutions. After a larger Bosch fridge freezer? 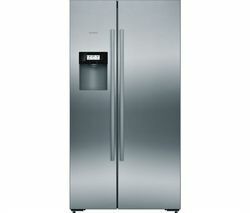 Check out our range of Bosch American fridge freezers.